These apartments are located in the centre of Puerto del Carmen, just across the road from a small sandy bay and only 800 m from the main beach of Puerto del Carmen. A good selection of bars and restaurants, nightlife spots, shops and public transport links that can be found in the vicinity. The complex is a 20-minute drive from Timanfaya National Park and Arrecife Airport is 10 km away. This apartment hotel features a garden, a children's playground, a café, a bar and a à la carte restaurant. Internet access is available and guests can hire bikes from reception. The bright and spacious apartments are comfortably furnished with a perfectly equipped kitchenette and living room area, a bathroom and a balcony or terrace. The complex comprises a large swimming pool, a children's pool and a sun terrace. For an additional fee guests can play tennis and pool. The golf courses are 20 km away. Make yourself at home in one of the 40 guestrooms, featuring kitchenettes with refrigerators and stovetops. Flat-screen televisions with satellite programming provide entertainment, while complimentary wireless Internet access keeps you connected. Conveniences include safes and separate sitting areas, and housekeeping is provided on a limited basis. Apartments located approximately 200 meters from the main beach in the center of Puerto del Carmen. It is a complex, pleasant, sympathetic and welcoming. 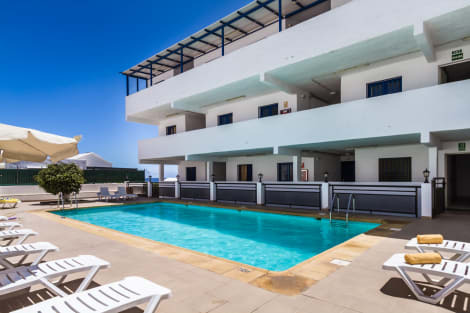 Its privileged location in a quiet area to spend a very relaxed and quietly near the Avenida de Las Playas, the main leisure center, Lanzarote with bars, restaurants, shops and all kinds of options for a fun vacation. No admittance to children under 16 years. When you stay at Apartamentos Tisalaya in Tias, you'll be by the sea, within a 5-minute drive of Puerto del Carmen Beach and Pocillos Beach. This apartment is 1.4 mi (2.3 km) from Rancho Texas Park Zoo and 10.9 mi (17.6 km) from Cesar Manrique Foundation. With a stay at Arena Dorada - Apartments, you'll be centrally located in Tias, a 2-minute drive from Puerto del Carmen Beach and 6 minutes from Pocillos Beach. This golf apartment is 1.6 mi (2.6 km) from Rancho Texas Park Zoo and 11.2 mi (18 km) from Cesar Manrique Foundation. Apartments located approximately 200 meters from the main beach in the center of Puerto del Carmen. It is a complex, pleasant, sympathetic and welcoming. Its privileged location in a quiet area to spend a very relaxed and quietly near the Avenida de Las Playas, the main leisure center, Lanzarote with bars, restaurants, shops and all kinds of options for a fun vacation. The modern Labranda Los Cocoteros Apartments is located by the sea and 9 km from Aeropuerto de Lanzarote. Its facilities include an outdoor pool and gardens for guests to enjoy. The smartly decorated apartments feature living rooms, TVs with international channels, bathrooms, and fully equipped kitchens with microwaves, toasters, kettles, and dishes.